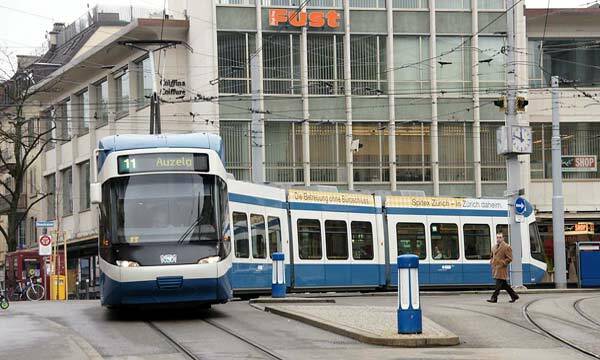 Zürich has a modern public transport network which branches out far and wide: trams, buses, ferries, suburb trains and funiculars combine to make up a comprehensive and efficient range of transport options. Good international rail links and the nearby Zürich airport make travel to and from Zürich simple and comfortable. Indeed, the majority of European capitals are no more than an hour's flight from Zürich airport. There are connections every half-hour from Zürich central station to all major Swiss cities (Zug, Lucerne, Basel, Berne and Geneva), while various high-speed trains (ICE – Germany, TGV – France and Pendolino – Italy) are linked to the rail network. Zurich also has a wide reaching network of S Bahns connecting the entire city and its suburbs. The first electric tram was introduced to Zurich in 1894 and today they still run very efficiently allowing all areas of the city to be quickly and cheaply reached. Not only does Zurich have Stadt Bahns and Trams but also Buses meaning that getting around Zurich is very easy. To get above the bustling streets and cobbled walkways, hop onto the Rigiblick Funicular for panoramic views of the city and Lake Zurich. The traditional Funicular was first opened in 1889 to solve the transport problem of students travelling from central Zurich to the University of Technology, which is situated on the towering Zürichberg hill. Recently renovated, the Funicular has maintained its classic Swiss appearance and continues to haul students and tourists to the Polyterasse viewpoint. Serving an attractive neighbourhood north of Zurich, the Rigiblick Funicular rewards travellers with a sweeping panoramic view of the city and the unmistakable Mount Rigi (1797m). Ferries are also a part of Zurich’s public transportation system, due to the city’s location at the mouth of the Limmat River on the northern shore of Lake Zurich. Ferries go to many different towns around the lake and operate every day from 09:00 to 19:00. Your ferry ticket also allows you to travel on other modes of transport such as trams, buses and trains. While in Engand commuters are looking at a £10,000 season tickets to London, Switzerland despite what you may have first thought has got several options to heavilly reduce your commuting costs. The Halb tax is probably the most common card in peoples wallets and understandibly so. For just CHF175 per year you pay half price for any ticket anywhere in Switzerland. The General Abonnement travelcard for a price starting at CHF3655 per year lets you travel anywhere in Switzerland for free. The Gleis 7 is a card that when combined with the Halb Tax card allows the owner free travel anywhere in Switzerland after 7pm. You can also arrange a variety of point to point or regional travelcards for a specific area or route. Holders of the city card ZürichCARD can enjoy the city to the fullest and at the same time get great value for their money. The principle is very simple: you purchase a ZürichCARD that is valid for either 24 or 72 hours and profit from free rides on the trams, buses, trains, boats and on the cableways in Zürich, free admission to all museums in Zürich, 10% discount at selected Zürich shops, a culinary surprise and further benefits. 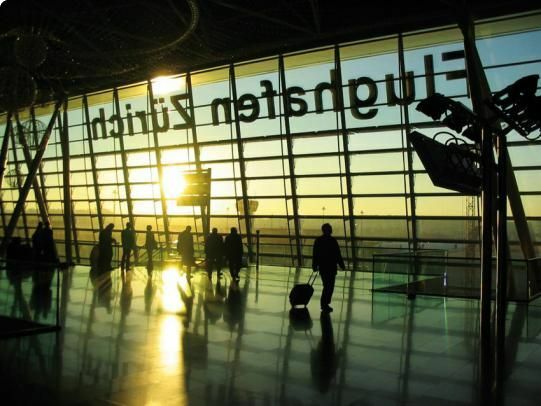 Zurich Airport is a 15 minute train ride from the Central Train Station. It is possible to fly to much of the United States in under 12 hours and to London in an hour and a half, whilst Shanghai and Beijing are around 15 hours away. One important fact to remember that is fairly unique to Switzerland is that drivers will normally always stop at every Zebra crossing for a pedestrian. It is important to follow suit as many people often walk onto the zebra crossing always expecting cars to stop. So be careful. And also remember to drive on the right.